Although we have only been alive for less than a year, we have a prediction: Buddha Belly is going all the way! On June 19th, Vickie Jurkowski wrote an article for the Daily Southtown entitled “Fields of Fun” highlighting a myriad of opportunities for families to enjoy while surrounded by nature. Unexpectedly, we were also featured in Sunday’s Life & Style edition of the Chicago Tribune on June 28th. Humbled and grateful for some exposure in both of these newspapers! More importantly, we would like to thank Tony Ndoca and Lexie Miller of Pick. 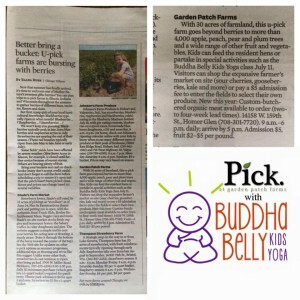 at Garden Patch Farmsfor believing in who we are and what we do. We are truly more complete because of you. Stay tuned for a blog post devoted to those perfect people at Pick! Those of you who know us or have read our initial blog post, know that we believe there is no such thing as coincidence. Our Buddha Belly Kids Yoga (BBKY) journey commenced and continues because our minds and hearts are open to what the universe has in store. Amanda McFayden, senior trainer at Rainbow Kids Yoga and founder of BlissKids used the most perfect visual of her hands stacking stones; with each small movement, everything began to build up and fall into place. We truly believe that is what is happening here at Buddha Belly. Jamie Gepner of little om BIG OM, the pioneer of movement and mindfulness in Madison, WI, planted the seed that we had a gift that needed to be shared with Chicago. Soon after, Meg woke up one morning knowing that our name was Buddha Belly Kids Yoga. We are women who don’t mess around with our guts, so it was an easy decision to trust our intuition. Our dear friends jumped on our yoga team to tackle the advertising world. Kristen Paige Gathanydesigned our adorable logo and Joe Calderone of Calderone Marketing gave breath into the life of this website. We knew that in order to grow, we would need to partner with an elite, established fitness organization. Dan Kane of Legacy Sports Camp was absolutely the right route to take in order to launch our inaugural summer camp. Ready for this connection?! Meg and Erin are close friends, co-workers, and business partners. Dan and Erin are childhood friends and fellow Chargers. Turns out that Meg and Dan’s grandmothers grew up as best friends in Oak Park. If that’s not the universe at work, we don’t know what is! Legacy Sports Camp in Oak Park allows elementary school children to learn proper technique in individual and team settings while instilling positive character traits in these young athletes. However, one could say that Legacy’s myriad of opportunities was missing one thing. Although Dan wasn’t familiar with yoga for kids, he trusted that Buddha Belly meant business and that we would not disappoint. 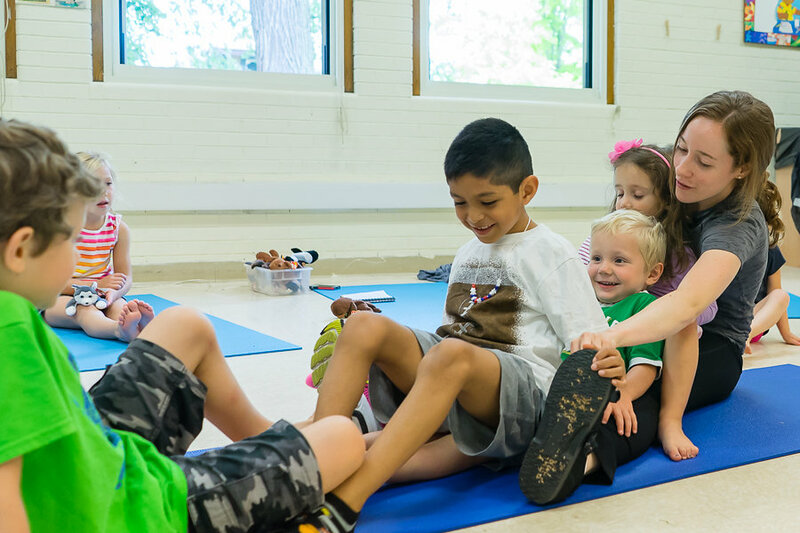 Yoga for kids is the perfect balance to a high energy sports camp. The juxtaposition of these two companies could not have aligned more perfectly. Just like that, Buddha Belly’s Legacy began! **Stay tuned for some amazing photos!